PKQuest, a new physiologically based pharmacokinetic (PBPK) program, is applied to human ethanol data. The classical definition of first pass metabolism (FPM) based on the differences in the area under the curve (AUC) for identical intravenous and oral doses is invalid if the metabolism is non-linear (e.g. ethanol). Uncertainties in the measurement of FPM have led to controversy about the magnitude of gastric alcohol metabolism. PKQuest implements a new, rigorous definition of FPM based on finding the equivalent intravenous input function that would produce a blood time course identical to that observed for the oral intake. This input function equals the peripheral availability (PA) and the FPM is defined by: FPM = Total oral dose – PA. PKQuest also provides a quantitative measurement of the time course of intestinal absorption. PKQuest was applied to previously published ethanol pharmacokinetic data. The rate of ethanol absorption is primarily limited by the rate of gastric emptying. For oral ethanol with a meal: absorption is slow (≈ 3 hours) and the fractional PKQuest FPM was 36% (0.15 gm/Kg dose) and 7% (0.3 gm/Kg). In contrast, fasting oral ethanol absorption is fast (≈ 50 minutes) and FPM is small. The standard AUC and one compartment methods significantly overestimate the FPM. Gastric ethanol metabolism is not significant. Ingestion of a coincident meal with the ethanol can reduce the peak blood level by about 4 fold at low doses. PKQuest and all the examples are freely available on the web at http://www.pkquest.com. Since the total input to the systemic compartment is proportional to the AUC (eq. 3), the fractional difference in the AUC for an oral and IV dose (eq 1) is a measure of the amount of the oral drug that never reached the systemic compartment because of FPM. This standard operational definition of FPM (eq. 1) is crucially dependent on the assumption that the removal rate is linear. If this assumption is invalid, then use of this definition can return very misleading results. A recent review has described the confusion that has resulted from applying this definition to human ethanol pharmacokinetics, a compound that has extremely non-linear liver metabolism . For the non-linear case, the intuitive idea that FPM is equal to the fraction of the absorbed drug that is metabolized in its first pass through the liver is no longer valid . Consider the case where GI absorption is occurring at a time when the systemic drug concentration is so high that the liver metabolism is completely saturated and the metabolic rate is constant, independent of concentration. Clearly, at this time, the rate of drug metabolism for an oral input must be identical to that for an IV input so that FPM must be zero, even though a large fraction of the absorbed drug may be metabolized in its first pass through the liver. This metabolized GI component is simply displacing systemic drug that would otherwise have been metabolized. In order to avoid these problems, Lieber and colleagues  introduced a new definition of FPM, based on estimating the "Peripheral Availability" (PA) of ethanol. The PA is defined as the total amount of ethanol that reaches the systemic circulation. Gentry et al. 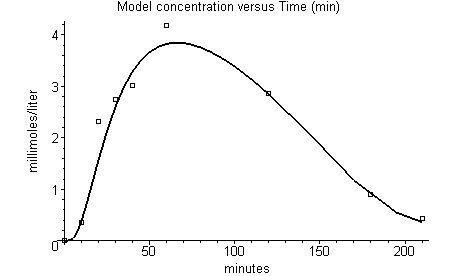 estimated the value of PA by assuming that the tail of the IV ethanol venous concentration curve can be approximated by a one compartment model in which the ethanol rate of metabolism (M) was defined by a Michaelis-Menten function (M = VmC/(Km+C)). The values of Vm and Km are found by curve fitting, and then PA is defined as the integral of M from time 0 to a long time when no ethanol is present. Thus, PA is defined as the total amount of ethanol that was metabolized from the systemic circulation. The FPM is then defined as the difference between the PA for an IV infusion and the PA for the oral intake of an identical dose. This one compartment definition of FPM has become the standard definition in some laboratories . This definition of FPM of Gentry et al. is inaccurate because it is a poor approximation to treat ethanol metabolism as a one compartment system (see below). Levitt and Levitt  described an approach to estimate PA using a two compartment model. They distinguished the liver ethanol that came directly from the GI tract from the recirculating ethanol, and derived an accurate approximation for this recirculating component. This 2 compartment approach provides a significantly more accurate (and smaller) estimate of FPM than the one compartment model. The 2 compartment model still makes some simplifying assumptions. These assumptions are eliminated in PKQuest , a new, general-purpose physiologically based pharmacokinetic (PBPK) software routine. The approach used by PKQuest is to first use the IV input data to find the PBPK parameters for ethanol, and then, using these parameters, solve for the time dependent IV input function that would produce a blood time course identical to the time course observed with the orally administered drug. This IV input function is a direct measure of the rate that the oral dose reaches the systemic circulation, i.e. the PA. Using as input just the PBPK parameters and the blood ethanol levels produced by an oral dose, PKQuest outputs (in both tabular and graphical form) the time course of the intestinal absorption and the PA (see  for the mathematical and computational details). The difficulty in defining the FPM of ethanol has created a controversy over the question of the magnitude of ethanol metabolism that occurs in the stomach before reaching the liver . It has been observed that the "FPM" is significantly reduced when ethanol is infused intraduodenally compared to the standard oral administration and this difference has been interpreted as representing gastric mucosal metabolism [6–8]. Clearly, if there are errors in the measurement of FPM then this estimate of gastric metabolism may be spurious. In addition to providing a value for FPM, PKQuest also provides a direct measurement of the rate and amount of the orally administered solute that reaches the liver. In this paper, PKQuest will be applied to investigations of human ethanol pharmacokinetics, providing information about the FPM; the time course of intestinal absorption, and the total amount of ethanol reaching the liver. This is the first human PBPK model for ethanol incorporating intestinal absorption and FPM. Pistino and Conolly  have previously developed a rat PBPK that quantitated ethanol FPM. The PKQuest program and all the examples used here are freely available on the WEB at http://www.pkquest.com. PKQuest  was used for all the analysis in this paper. All the figures shown in this paper are direct copies (in jpeg format) of standard PKQuest output. PKQuest makes several simplifying assumptions (see  for details). It is assumed that each organ can be modeled as a single well-stirred compartment. In addition, for the two solutes investigated in this paper (D2O and ethanol) it is also assumed that the blood-tissue exchange is flow limited so that the unbound water concentration in the tissue is equal to that in the vein leaving the tissue. This is clearly an approximation and effects such as diffusion gradients, countercurrent exchange and heterogeneous organ blood flows [10–12] will produce small deviations from this assumption. The PBPK parameters used here are identical to those used in all the other applications of PKQuest [5, 13, 14]. The procedures used for choosing and refining these parameters has been described in . Table 1 lists the organ weights (Kg) and blood flows (liters/min/Kg) for the standard 70 Kg human. The "liver" flow is the hepatic blood flow; "portal" refers to the portal vein blood flow and to the organs drained by the portal vein (stomach, small and large intestine, spleen and pancreas); "bone" refers to the inert component of bone, cartilage etc. in which it is assumed there is no solute distribution or blood flow; and "other" are all the other organs with a flow and weight adjusted to account for the total body weight (70 Kg) and the total default cardiac output (6.06 liters/min). These organ weights are for the default value of 20% body fat. They are scaled depending on the value of "Fat" that is input. For a complete listing of all parameters and constants used in PKQuest, download the file gensolve.mws from the PKQuest web site http://www.pkquest.com and view the routines "standardman()" and "defaultpar()". The D2O data was obtained from the measurements of the Schloerb et al. of the arterial serum concentration after a 15 second bolus injection. The results are for one experiment on one male subject (J.O., total body water of 48.0 liters, Table I). The amount of D2O injected was back calculated from the total body water and the concentration after 90 minutes when the D2O had equilibrated. A baseline ethanol PBPK model was developed based on the careful and detailed measurements of Norberg et al. 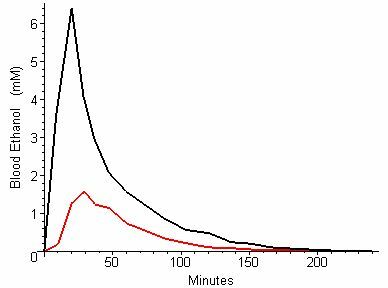 of the simultaneous breath and venous blood concentrations for a 30 minute constant IV ethanol infusion. The concentration calculated from the breath measurements was in good agreement with the direct venous measurements. The breath results were used here since they should be closer to the ideal of an arterial sample then the venous measurements from the cubital vein. The total body water for each subject in this study was directly measured using D2O. The time course of the mean values for all 16 subjects (figure 1, ) was modeled using PKQuest. The data of DiPadova et al. was used for the determination of the rate of absorption of oral ethanol, along with calculations of the PA and FPM. PKQuest was applied to the data plotted in figures 1 and 3 of DiPadova et al. which describe the mean blood ethanol for subjects given 0.15 g/Kg body weight (fig. 1) or 0.3 g/Kg (fig. 3) either orally (with or without a breakfast) or IV on alternate days. Comparison of the time course of the D2O arterial blood water concentration (solid line) and the experimental results (squares) of Schloerb et al. using the default PBPK parameters. A) Default muscle blood flow. B) Twice the default muscle blood flow. Comparison of the time course of the ethanol arterial blood water concentration (solid line) and the experimental results of Norberg et al. . Experimental venous ethanol concentration when a dose of 0.15 gm/Kg ethanol is administered either IV (black) or orally (red) along with a coincident meal. (Data taken from fig. 1 of DiPadova et al. ). The experimental data points were obtained by using UN-SCAN-IT (Silk Scientific Corporation) to read the data from the published figures. The published data was for subject JO (body weight 81.9 Kg and total body water = 48 liters). This value for total body water (0.58 liter/Kg) corresponds to a body fat fraction of about 0.2 .. This subject was defined as the "standardhuman" (Fat = 0.2). The values of the water fraction parameter for each tissue compartment in PKQuest was then adjusted so that the model total body water equaled this measured value. Since, this man is the "standardhuman", all the PBPK parameter are input simply by calls to the "defaultpar()" and "standardhuman()" procedures. All units in PKQuest are in terms of liters, Kg and minutes. The parameter "cunit" is the amount unit (concentration = cunit/liter). Since the D2O concentration was expressed in vol%, this corresponds to a cunit of 10 ml. The only other information that is needed is concunit [artery] = 3, which indicates that the input data is the arterial free water concentration. 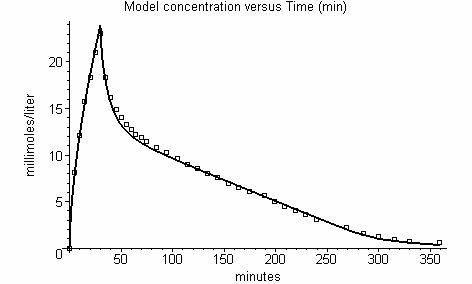 The observed equilibrium concentration was 0.144 vol% which corresponds to a total D2O dose of 69.05 ml, or 276 ml/min for 0.25 minutes, or 27.6 units/min if 1 unit = 10 ml. The output of PKQuest for this data is shown in fig. 1A (all of the figures in this paper are taken unmodified from the standard output of PKQuest). The value for the resting muscle blood flow (0.0266 Lit/min/Kg) was determined by adjusting the flow to optimize the fit to the data using the Powell minimization procedure of PKQuest. The agreement between the PBPK prediction (solid line) and the experimental measurements (squares) is very good. This agreement is sensitive to the value used for the muscle blood flow. For example, fig. 1B shows the effect of doubling the total muscle blood flow from this default, best fit, value of 0.0266 to 0.0532 liters/min/kg (increasing the cardiac output from 6.06 to 6.93 liters/min for a 70 Kg man). Muscle blood flow can vary many fold and one would expect that it would depend on the specific experimental conditions, such as whether the subject was supine or ambulatory. In any case, muscle blood flow is routinely varied when fitting data with PKQuest. This variation may have some physiological significance and/or it may be just a "fudge factor". The value for Fat (fraction of body weight that is fat) of 0.24 was chosen so that the model subject had a water volume equal to the average D2O volume of distribution of the 8 males and 8 females in the study (44.5 liters for 80 Kg human). The muscle blood flow was the same as the (default) value that was used in fig. 1A for the D2O data. Since liver metabolism accounts for greater than 95% of ethanol removal, it is assumed that the liver is the only site of ethanol elimination . The liver metabolic constants (Vm = 2.1 millimoles/min for 80 Kg man, Km = 0.04 mM) were adjusted using the Powell minimization procedure of PKQuest to give the best fit to the data. These values refer to the free water concentration in the liver (see  for details). There are a number of isoenzymes of alcohol dehyrogrenase (ADH) in the human liver and this model Km of 0.04 mM is consistent with the in vitro Km of 0.048 mM observed for one of these isoenzyme . It is assumed that ethanol distributes in the total body water, which is the default in PKQuest. The parameter fw [lipid] = 1/0.074 represents the inverse of the oil/water partition coefficient and indicates that the equilibrium ethanol concentration in the body fat is 7.4% of the concentration in body water . The ethanol dose was 0.4 gm/Kg, given as a constant 30 minute infusion, corresponding to an infusion rate of 23.15 millimoles/min for an 80 Kg human. This Maple procedure (ethanol_norberg) completely specifies the PBPK parameters. All the other model parameters are set by the calls to defaultpar() and standardhuman(). Figure 2 shows the output of PKQuest for this input. Again, the agreement between the PBPK prediction for the arterial blood concentration (solid line) and the observed breath data (squares) is quite good. DiPadova et al. measured the blood ethanol in subjects that were given the same dose of ethanol, either IV (20 minute constant infusion) or orally (over 10 minutes), on consecutive days. Figure 3 shows the venous concentrations as a function of time when a low dose of ethanol (0.15 g/Kg, equivalent to approximately 12 oz of beer) was given at the same time as a standard breakfast either IV (black) or orally (red). The area under the oral dose curve is only 27% of that for the IV dose. This would correspond to a FPM of 73% if metabolism was linear – i.e. only 27% of the orally ingested ethanol reaches the systemic circulation.. As will be shown below, the actual FPM is much less than this. The data in fig. 3 was analyzed using PKQuest. Figure 4A shows the agreement between the PBPK model and the venous plasma ethanol concentration for the IV input data. The PBPK parameters used in this calculation were identical to those used for figure 2 except that the portal blood flow was increased 50% because of the coincident meal [22–24], the liver Vm was increased from 2.1 to 2.5 because of the induced ethanol effect [25, 26] and the muscle blood flow was doubled. Also, the parameter "concunit [vein]" was set = 2, indicating that the whole blood venous concentration was used as the input data. PKQuest predictions for an IV or oral input of 0.15 gm/Kg coincident with a standard meal. A) Comparison of the model time course of the ethanol venous whole blood concentration (solid line) and the experimental results (squares) of DiPadova et al. for the IV input. B) Predicted total ethanol intestinal absorption (squares) and peripheral availability (diamonds) for the oral dose. The solid line is a 3 parameter approximation to the model absorption data. Figure 4B shows the output of PKQuest when the "findabsorption"  option was applied to the oral ethanol input data. Since the IV and oral data used for figs. 4A and 4B were collected in the same subjects under identical conditions, exactly the same PBPK parameters where used for both calculations. The open squares show the time course of the predicted GI ethanol absorption (amount entering the liver in the portal vein ). The solid line is a 3 parameter approximation to the absorption data (absorption at time t = A [tH/(tH +TH)] where A = total absorption, H = Hill exponent, T = half time). It can be seen that the intestinal absorption (fig. 4B) is complete within about 2 hours. The total predicted absorption of 250 millimoles is slightly less than the actual total oral dose of 260 millimoles. Although this is consistent with a small amount of gastric mucosal metabolism (10 millimoles) it is probably not significant. The calculation of the total absorption for this low dose is critically dependent on the accuracy of the venous blood measurements at long times. Since the liver has such a low Km (0.04 mM), significant amounts of intestinal absorption could be occurring at long times even though the venous concentration remained close to zero because of the high rate of liver clearance. The fluctuation in the total absorption points at long times in fig. 4B is caused by errors in these long time blood measurements. When the "findabsorption" option is used, PKQuest also routinely calculates the time course of the "Peripheral Availability" (PA), indicated by the diamonds in fig. 4B The PA is defined as the equivalent IV input that would produce the observed venous concentration. Thus, an IV input with the time course of the diamonds in fig. 4B would produce exactly the same blood concentration as a function of time as the GI absorption represented by the open squares. PA is related to FPM by the relation: FPM = Total Dose – PA. Thus for the data used for fig. 4B, the PA of 160 millimoles corresponds to a FPM of 100 millimoles (total dose = 260). This represents 38% of the total dose, about half the value of 73% using the classical AUC approach. The FPM for this data was also estimated by using the one compartment approach . Figure 5A shows the optimized one compartment Michaelis-Menten fit to the tail of the venous ethanol data (Vm = 8.68 millimoles/min; Km = 5.46 mM). Figure 5B shows the corresponding fit to the data of DiPadova etal. for a doubling (0.3 gm/Kg) of the oral dose (see below). Not surprisingly, a one compartment model does not provide an accurate fit to the ethanol data. The fit is better for the large input dose. Using these values of Vm and Km, the PA was determined for the IV and oral dose by assuming a one compartment model and integrating the liver metabolism (= VmC/(Km+C) where C equals venous blood concentration) over the time. For the data of fig. 4, this one compartment method yielded a FPM of 59%. This is less than the 73% estimated from the AUC, but significantly greater than the 38% using PKQuest. Optimized one compartment fit to the tail of the venous blood curve for IV ethanol. A) IV input of 0.15 gm/Kg. B) IV input of 0.3 gm/Kg. DiPadova et al. also measured the blood levels resulting from an IV or oral input of a larger ethanol dose (0.3 gm/Kg, total dose of 520 millimoles for the 80 Kg model subject) and this time they also compared the fasting and standard breakfast case. Figures 6A and 6B show the PKQuest output for the IV and oral data when the ethanol was taken with the same standard meal as was used for the data in figs. 4A and 4B. The parameters were identical to those used in figs. 4 except that the liver Vm was reduced from 2.5 to 2.4 (a different set of subjects were used in the two sets of experiments). It can be seen from fig. 6B that, for this higher dose, the total peripheral availability (diamonds) is only about 40 millimoles less than the total dose of 520 millimoles, corresponding to a fractional FPM of 7%. This is much less than the FPM value of 44% determined by using the AUC approach or of 30% using the one compartment approach. The time course of the intestinal absorption for the two doses (compare fig. 4B and fig. 6B) has the same shape (e.g. same Hill coefficient) but occurs over a slightly longer time for the larger dose (Hill half time = 34 minutes for 0.15 gm/Kg dose, and 48 minutes for 0.3 gm/Kg dose) presumably because the larger oral dose was ingested over a longer time (20 minutes for 0.3 gm/Kg versus 10 minutes for 0.15 gm/Kg). Similar to fig. 4 except that the IV dose was 0.3 gm/Kg. Figures 7A and 7B show the PKQuest output for the same ethanol dose (0.3 gm/Kg) given to fasting subjects. The PBPK parameters for these experiments had the portal blood flow reduced back to the default fasting value. Also, the liver Vm was reduced back to 2.0, the same value that was used for the fasting data of Norberg et al  in fig 2. This change in ethanol metabolism is consistent with earlier observations that the rate of ethanol disappearance from the blood is increased by a coincident meal [25, 26]. It can be seen in fig. 7B that the PA (diamonds) is nearly identical to the GI absorption (squares) so that FPM is close to zero for the fasting subjects. The AUC and one compartment approach also indicate a small FPM for this case. Similar to fig. 6 except that the subjects were fasting. The philosophy behind the use and development of PKQuest differs from that of the standard PBPK applications. PBPK models have usually been applied to animal data where it is possible to accurately measure and control the relevant parameters (tissue distribution, organ blood flows, etc.). In contrast, for human studies, not only are the PBPK parameters poorly characterized, but they are subject to large individual variation. The impetus behind PKQuest is to try and develop a "standard" set of human PBPK parameters that can be applied in the absence of this detailed information. For this reason, the application of PKQuest to human data should be regarded as a first approximation. Since muscle represents roughly 50% of the body mass, the muscle blood flow, which can vary 10 fold or more depending on experimental conditions, is the single most important PBPK parameter and the parameter that limits the accuracy of the PBPK model. The pharmacokinetics of D2O (or other tracers of water) are especially simple since the rate of elimination is very slow and it distributes simply in the organ water. As shown by figs. 1A and 1B, the D2O kinetics are sensitive to the muscle blood flow and the data of Schloerb et al. was used to determine the resting muscle blood flow value (0.0266 liters/min/Kg) for the "standardhuman". Although it is problematical to base such an important parameter on just one set of measurements on one subject, this represents the only published measurement of this type that I could find. It is also an approximation to treat the muscle as a single compartment with a uniform blood flow and in some human PBPK models  two muscle compartments ("resting" and "working") are included. For the PKQuest modeling, the muscle blood flow is usually treated as an adjustable parameter and not as a strictly determined PBPK constant. The ethanol data that was modeled are the mean values, averaged over a number of individuals. Because of the non-linear nature of the pharmacokinetics, it is an approximation to treat these mean values as representative of an equivalent "average" human . However, it should provide a first approximation to the PBPK parameters of an "average" human. For the common case where the published mean values are the only data that is available, there is no other option. In the PKQuest modeling of ethanol, it is assumed that ethanol distributes freely in the tissue water. This seems like a reasonable assumption given the physical-chemical properties of ethanol. Measurements of plasma/whole blood concentration ratios show that this assumption is valid for red blood cells . However, Norberg et al. [16, 19] has shown that the ethanol volume of distribution estimated using a 2 compartment model is significantly less than the total water volume and they have reviewed the literature that suggests that the tissue ethanol distribution may be restricted. Despite this, the agreement between PKQuest results and the Norberg et al. data (figure 2) indicate that this assumption is a useful approximation given the limitations of using the mean data. The definition of FPM implemented in PKQuest is both rigorous and intuitive. It is based on defining a time dependent "peripheral availability" (PA) that is equal to the rate of IV input that would produce the observed time course of the plasma ethanol concentration. This PA is a direct quantitative measure of the amount of ethanol that has reached the systemic circulation. The FPM is then defined as the difference between the total dose administered and the PA. The classical procedure of determining FPM from the AUC (eq.1) markedly overestimates the FPM. For the case of the small ethanol dose (0.15 gm/Kg) taken with a meal, the AUC estimate of fractional FPM of 73% was about twice the value (38%) obtained using PKQuest. For the higher dose (0.3 gm/Kg) the error was even larger (44% versus 7%). Although the more recent one compartment approximation provides a better estimate of FPM, it is still significantly larger than the PKQuest values (59% versus 38% for 0.15 gm/Kg dose and 30% versus 7% for 0.3 gm/Kg dose). The error in both these approximations to FPM results primarily from the fact that the systemic appearance of the oral ethanol taken with a meal is slow compared to the 20 minute constant infusion that was used to obtain the IV AUC. Since the liver ethanol metabolism saturates at low concentrations, the shorter dose will have a higher average blood concentration and a corresponding lower value of fractional metabolism. The error would be less if the time course of the oral absorption was similar to that of the IV input. This explains why the AUC calculated FPM  was greatly reduced when the subjects were fasting so that the gastric emptying rate was increased and GI absorption was more rapid (compare figs. 6B and 7B) and closer to the rate of IV infusion. The critical dependence of the AUC on the rate of systemic ethanol input was first pointed out by Wagner . He showed that the AUC for the oral input was equal to (or even larger than) the IV AUC if the IV infusion was administered at a slower rate (for 2 hours) than the rate of intestinal absorption. Failure to appreciate the problems inherent in using the AUC or one compartment method to measure FPM has led to the concept that the gastric mucosa metabolizes a significant fraction of oral ethanol. Lieber and colleague observed that the "FPM" was reduced when ethanol was infused intraduodenally compared to the standard oral administration and concluded that the difference must have resulted from gastric mucosa metabolism [6, 7]. This decreased FPM for the intradudenal dose is probably a result of the much more rapid time course of absorption when the ethanol is administered directly into the duodenum. PKQuest provides a direct estimate of the amount of ethanol reaching the liver. As shown by figs. 4B, 6B and 7B, the total amount of absorbed ethanol reaching the liver does not differ significantly from the total oral dose, indicating that gastric mucosa metabolism is negligible. In addition to providing a direct measure of PA and FPM, PKQuest also provides, for the first time, quantitative information about the rate of intestinal absorption of an orally administered drug that has non-linear metabolism. A comparison of figs. 6B and 7B provides a dramatic view of the decreased rate of ethanol absorption when it is accompanied by a meal. In the fasting state, ethanol is almost completely absorbed within 50 minutes (fig. 7B) while the ethanol administered with a standard breakfast takes 3 or more hours for complete absorption (fig. 6B). Levitt et al. simultaneously measured the rate of human gastric emptying and ethanol blood concentration with and without a meal and concluded that the rate of ethanol absorption was primarily limited by the rate of gastric emptying. The similarity between the time course of ethanol absorption seen in figs. 6B and 7B and the gastric emptying time course observed by Levitt, et al. supports this conclusion. This corresponds to a total input of 524 millimoles into the portal vein ("organ = liver") with a Hill coefficient ("hn") of 1.87 and a half time ("tend") of 48.28 minutes. Figure 8 shows that the simulated blood level for this input function (solid line) slightly underestimates the peak value, but otherwise is in good agreement with the experimental data (squares) that was used to determine this input function. In Figure 9 this feature is used to illustrate the dramatic effect of a concomitant meal on the blood levels resulting from an oral intake. The figure shows the blood levels for an oral intake of 260 millimoles of ethanol (red line, roughly equivalent to one 12 ounce can of beer); and 2 (green) or 3 (blue) times this dose, all ingested for a 20 minute time period either with ("fed") or without ("fasted") a meal. The model results for the "fed" case (fig. 9, left) used the above rate of intestinal absorption determined from the data in fig. 6B. The "fasted" case (fig. 9, right) used the intestinal absorption rate determined for the fasting data in fig. 7B (Hill coefficient = 2.6; half time = 26.84 minutes). In addition, the corresponding values of liver Vm and portal blood flow for the fed and fasting conditions are used in this simulation. The influence of a meal on ethanol blood levels is especially dramatic at the low intake dose, decreasing the peak blood level by about 4 fold. Comparison of PKQuest prediction of venous blood level (line) versus the experimental data for an oral dose of 0.15 gm/Kg. The PKQuest intestinal absorption was described by the 3 parameter Hill equation obtained in fig. 6. Predicted venous ethanol concentration for an oral intake of 1 (red), 2 (green) or 3 (blue) cans of beer over a 20 minute period. A) Coincident with a standard meal. B) With no other food.